In Vinilos Casa ® We have always differed from other pages of Luminescent panels dividing fluowall for our reliability, innovation and quality of our products, therefore once more are the first to offer a commitment to 24/72, that is to say, if in 24/72 hours. We have not sent your order "YOUR PURCHASE TEA FREE". In Vinilos Casa ® do not put requirements or obligations, nor nothing that can tie you, so you can always do your shopping with maximum safety and confidence that only Vinilos Casa ® It can offer you. In the case of our commitment to 24/72, the time will begin to elapse after receive the payment of your purchase (For payments on income account or bank transfer, this time starts to pass once we can confirm that the payment has been received, i.e., when we can confirm your payment from our bank account). For orders placed on holidays or not working (Saturdays and Sundays) time starts to passthe first business day following the holiday or non-working. You make your purchase a day Saturday or Sunday, the time of our commitment to 24/72 would begin to elapse on Monday (provided that day is not a holiday). You make your purchase a holiday, for example on October 12 (Día de la Hispanidad)If that day is a Saturday or Sunday, Monday (if that day were not festive), if the October 12 a day Friday, then time would begin to elapse from Monday, provided this day is working. In short, whenever you purchase make it in business days, in Vinilos Casa ® We are committed to that your order be sent before 24/72 hours. and if we do not fulfill our commitment "YOUR PURCHASE TEA FREE". Which is countries aimed at? Gives equal where you live or where you want to send your purchase, since our commitment to 24/72 It is addressed to all countries of the world. All orders received after 12:00 pm They may not be shipped the same day of purchase. 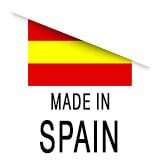 For countries outside of Spain, European Community or areas within the Spanish territory (Canary Islands, Ceuta, etc.) that require processing, taxes and/or customs charges, these expenses or payments shall be borne by the customer on the target, so it will not reflected in the invoice issued by Vinilos Casa.